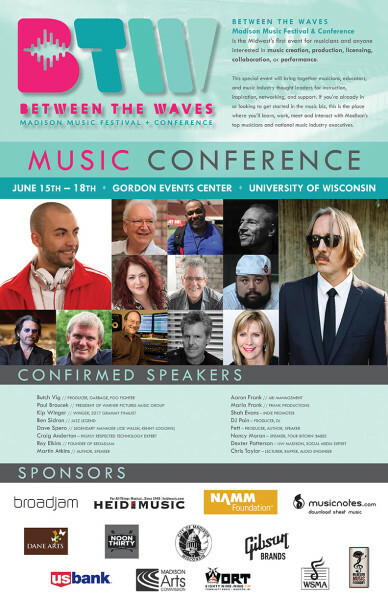 Tickets for the first Between the Waves Madison Music Conference and Festival can be purchased here. The schedule of events and roster of speakers and panelists is subject to change and is being updated frequently. You can keep an eye on the progress of this historic event by following the Facebook page or by visiting the website often. After years of discussion, debating and even dreaming, the city of Madison will take a huge step forward in June with its first music conference. 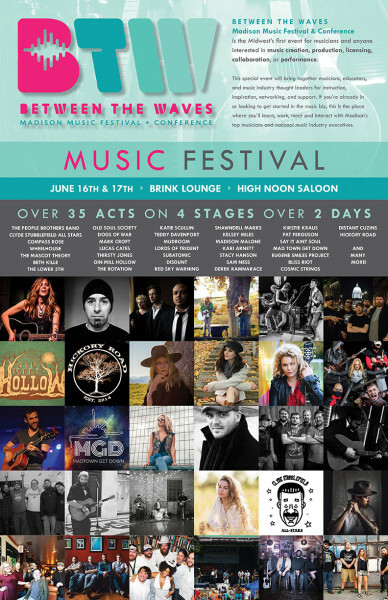 The inaugural Between the Waves Madison Music Conference and Festival will take place Thursday, June 15 through Sunday, June 18. The conference’s goal is to provide independent musicians with the tools that can help them make a living in music. The conference curriculum is not just geared toward the performer but to the producer, engineer, businessperson and songwriter, encouraging them to focus on building a foundation in a hundred mile radius. The festival portion of the annual event will highlight the city of Madison, its musical heritage, future potential and especially its current roster of talent. Some forty local performers will participate in entertaining conference attendees, making an impression that they’ll take back to their respective cities and hometowns along with a message that Madison is poised to become an important music city, with a thriving music scene that is above all, functional and ready to roll. Between the Waves Madison is founded by Roy Elkins and there is no one more suited to the task. Elkins is the President of Broadjam, Inc., one of the premier – and longest running – internet-based music companies in the world. Broadjam boasts a membership of 180,000 collaborators and peers in 190 countries who seek to further their careers and hone their skills with opportunities for licensing their music in multiple mediums. Broadjam is also a powerful social media site where musicians from across the globe interact, connect and collaborate. Through the peer review mechanism, Broadjam members gain powerful insights into their songwriting, arranging and production skills. Elkins, who has also served as the President of the Madison Area Music Association, and whose company has been instrumental in providing the technical means for the organization to manage its annual awards selection, lives a relatively quiet life but is a rock star in the international music trade. Go to a NAMM (National Association of Music Merchants) show and there are likely to be more people hounding Elkins than some of the bona fide rock stars in attendance. In harmony with many of these efforts, high-school level youths who are participating in music through their schools or through private instruction are being actively sought to attend the conference for free. Anyone interested in reserving a youth pass should contact Mary Elsner at mailto:melsner@wsmamusic.org. Elkins succeeded in getting the city behind his vision, a critical element in helping put Madison on the musical map. “The world needs to know” is a slogan the BTW organizers have adopted as a battle cry in an effort to make Madison a music city; a destination rather than a flyover. The concept is part and parcel of the growth and development the city is experiencing, particularly in the East Washington Avenue corridor, where a transformation is taking place. As the conference grows in the coming years, the intent is to bring in as many as ten thousand attendees, fueling the city’s tourism and creating opportunities for artists to relocate here to build their careers. This is in stark contrast to the tradition of Madison artists who are compelled to relocate in order to further their artistry. At the same time, the conference will keep the spotlight turned on the city itself, its thriving roster of exceptional talent, the natural beauty of the area and its proximity to the other major hubs in the Midwest, from Nashville to the Twin Cities. Such an influx of attendees will stimulate room taxes, provide a boost to the local economy and encourage future growth. Elkins has assembled a team of volunteers that have been working extraordinarily hard, jumping the hurdles and busting through the roadblocks that can make the first year of such an undertaking incredibly difficult. The first-year planning has had plenty of obstacles to deal with. For instance, merely finding a facility to present the curriculum was difficult. Space being limited, there were few options by the time the event was given the green light. Elkins succeeded in securing the upper level of the Gordon Dining and Event Center on the UW campus with sponsorship help from the UW School of Music. Gordon Dining Hall is actually a well-equipped and spacious facility; a huge area that can be subdivided to create four large rooms, all equipped with the technology to make presentations. The lower-level dining hall makes the facility especially efficient. Even so, there are restrictions, especially on Saturday where some of that space is not available. Attendees will also travel a couple of blocks to the Doubletree Inn and their conference room. Coordinating speakers, travel arrangements, hotels have all been challenging for the group to get things off the ground. Heading up the festival side is Luke Jorgensen, creator of the annual Whiskeyonsin event and front man for the local Americana group the Lower 5th. Jorgensen has done an exceptional job, recruiting all the performers and making arrangements to center the performances at the 701 East Washington complex, home of the High Noon Saloon, the Brass Ring and the Brink Lounge. There will be an outdoor stage as well, so a very festive setting indeed. Additionally, there will be a hip-hop showcase, a free show at the Majestic on Saturday, June 17th. Wristbanding will provide easy access to all performance areas. In the future, the conference could become the centerpiece for a full week of local music celebration that could incorporate the Madison Area Music Awards and several other events that occur in June as well as the staging of even more festival events on the Monona Terrace rooftop, the King Street area, the lower Wilson St. venues and other destinations. With the city’s support and the support of other institutions such as Tourism, the possibilities are enormous. $69.00 includes admission to the full conference and festival. $99 VIP includes the above plus a ticket to the Madison Area Music Awards show on Sunday, May 18, a pass to a pre-MAMA VIP party, a $50 credit on the Broadjam site and a BTW t-shirt. All venues will charge a $10 cover at the door per venue. The hip-hop showcase at the Majestic is a free show. There are two aspects of the conference that will be open to the public. The conference will open on Thursday night at 6 pm with a social hour and a thirty-minute opening for the conference. At 7 pm Paul Broucek will present “Music in Film.” Broucek is President of Warner Bros. Pictures and has worked as the Executive Music Producer at New Line Cinema where is most famously known for his work producing the music for the Lord of the Rings trilogy. This is a presentation that you will not want to miss. The public can attend this session for an entry fee of $10.00. On Sunday there are a series of presentations by notable speakers including Martin Atkins, David Spero, Kip Winger, Ben Sidran and Craig Anderton. These sessions will also be available to the public for an entry fee of $10 to see all the speakers. All the public sessions are limited, based on available seating. For full bios on speakers (and updates) go here. A publishing panel made up of film and television experts will examine music samples from conference attendees and provide feedback and advice. Submissions are limited. Keep an eye on the BTW website for information on how to participate. Kip Winger will be interviewed on Sunday and will give intimate details on his career and experience in the music business, interspersed with solo performance. This will be a special, intimate look an artist who is too often associated only with the hard rock band that bore his surname. Winger has won accolades in classical composition, production and in the field of ballet. David Spero’s presentation will also highlight Sunday’s activities. As manager for Joe Walsh, Yusuf Islam (Cat Stevens), Kenny Loggins, Michael McDonald and Dickie Betts, Spero’s delivery will be one of importance for all aspiring musicians and all those interested in the management of artists. If you’ve never attended a presentation by Martin Atkins, this will be your opportunity. Atkins never disappoints with his candid and passionate delivery and his common-sense approach to the business of independent promotion and touring. Atkins was the drummer in Ministry and P.I.L. so he has plenty of insight, delivered with flair and no shortage of humor. Below are two graphics that promote the conference and festival. There will be updates and you can check everything by going to the BTW Madison website.